Maarten de Vries was asked to provide an astronomy course by an adult Education Learning Centre. As part of the observing sessions a number of the students and HAS members managed to view Mercury on 24th February at Culloden Battlefield car park. For some this was their first sighting of this elusive planet. In the spring, HAS and SIGMA took part in Science Week. We received charitable status in April. This will help in our quest for finding funding for our new observatory; a tremendous boost for which came in June with the award of £24,966 from H2007 followed later by £9893 from Awards for All and £3000 from the Highland Council Common Good Fund. The design for the new observatory became settled. A nine foot dome will house a 14" Richey Chretien telescope and there will be a heated observing station with computers, the screens of which will show the images that are being viewed through the telescope, thus allowing the disabled to take part. Our social event - a barbecue at Simon Urry's house - took place in June with perfect weather and was attended by quite a few members. By August, our website was receiving 1000 visitors a day and in September it was made website of the month by the East Antrim Astronomical Society. We had two open days in September. The 'Your Inverness' event attracted a large number of Clubs and Societies, although not so many visitors. The Eastgate Centre open day was a great sucess. 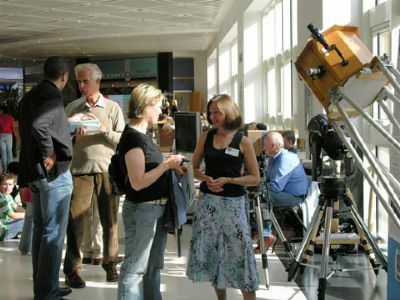 There were telescopes on display; a large TV and DVD showed astronomical images, Arthur Fraser's laptop displayed various astronomical programmes and we gave out starcharts, programmes (80) and paper space shuttles to make. This was followed by a public viewing event in the evening. The night sky was crystal clear so not only were we able to see many deep sky objects and the Milky Way, but we were lucky enough to be treated to an aurora as well! John Brown, the Astronomer Royal for Scotland gave us a talk in October using magic tricks to demonstrate some of the more more difficult principles of astronomy and cosmology. He has very kindly offered to help in any way he can with the new observatory and he has sent his Coat of Arms to display.